As the first anniversary of the commencement of the war came and went, the national recruitment effort gained momentum in response to the natural flow of volunteers beginning to slow. Monthly recruitment figures for NSW had actually seen their war-long peak in August 1915 at 12,991. They then dropped by almost half the following month, and almost half again in October. In late 1915, and early 1916, a particular response to the call for more volunteers, was conceived of largely by members of the New South Wales public. 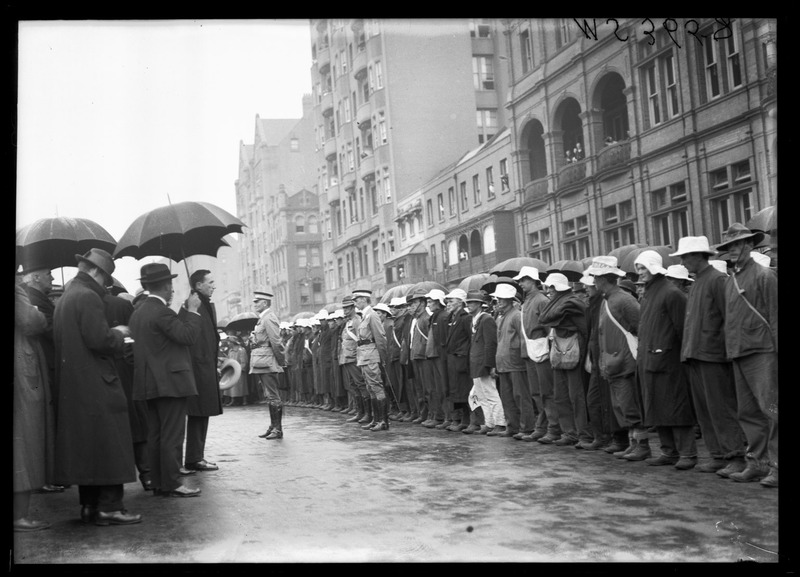 Eight recruitment, or ‘snowball’, marches as they were popularly known, travelled from major rural centres through countless townships, towards Sydney – stirring up patriotic, and enthusiastic support as they went. Information about the organisation of some of these marches has been identified in NSW State archives. During October, 1915, the first of the recruitment marches, the ‘Gilgandra Snowball’ known as the ‘Coo-ees’ left Gilgandra on Sunday 10 October 1915. The march had been conceived and organised by local plumber and Captain of the Gilgandra Rifle Club, William Thomas Hitchen, with assistance from Alex Halden Miller, a local businessman and secretary of the local recruiting association. After initial difficulties in gaining support from the Commonwealth military authorities, the organising committee sought assistance from the President of the State Recruiting Committee (Premier Holman) for supplies and equipment. The Premier’s Office took an interest in the Coo-ees march, sending State Recruiting Committee Chief of Staff Edward Hugh Palmer to Gilgandra to assess the preparations there on the weekend of 2-3 October 1915. Palmer, who was otherwise employed as Chief of Staff for the NSW Immigration and Tourist Bureau, reported back on 5 October [see Figs. 1-3]. He noted a warm reception by the town, and described the effective organisation of the march. Palmer expressed his strong belief that this type of recruitment activity would have the potential to “present a solution to certain of the recruiting problems” which were anticipated by the authorities at the time; namely, the public awareness of the ‘hopelessness’ of the Gallipoli campaign, the perceived unhealthiness of NSW military training camps, and other general factors such as family responsibilities, and the anti-recruiting movement. To ensure the utmost success, Palmer recommended that a recruiting officer from the military should accompany the march, and that the men be supplied with rifles for target practice, as well as tents and blankets. 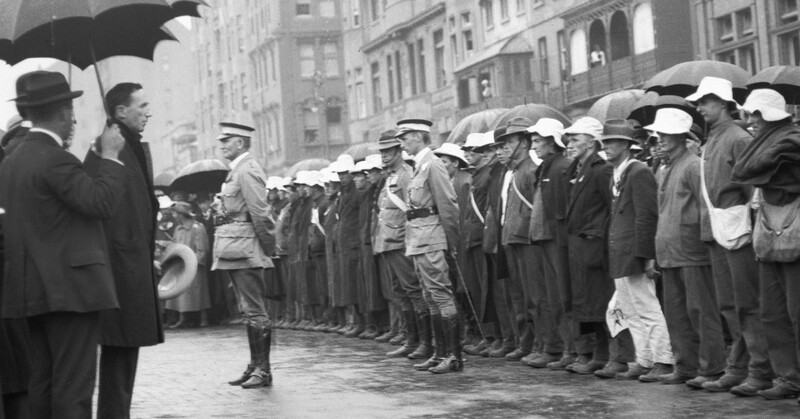 Palmer’s superior officer Percy Hunter, Superintendent for the Immigration and Tourist Bureau and Honorary Director for the NSW State Recruiting Committee, agreed with these views and urged the Premier to seek support for the march from the military authorities. Rural newspaper, the Farmer & Settler, also sought support for the march from the Premier for the provision of tents and blankets, while providing details on the preparations more broadly [Figs. 4-6]. The Coo-ees march collected recruits in each town as it went, passing through Wellington on 17 October, where 26 men applied to join (with 16 being accepted), before the march set off at 10am the following morning. When the march reached Ashfield Town Hall on 11 November, the Police Band had been arranged to be playing amongst the welcoming party. The following day, 263 volunteers  arrived to a huge reception in Sydney. On 22 November, 1915, the Premier’s Office requested to know details of all donations made to the Coo-ees during their march. A balance sheet was provided on 31 December 1915 to the Premier via the State Recruiting Committee [Fig. 7], showing that a total of over £800 had been donated to the cause. As it was with all such marches, support came primarily from the communities the march passed through along the way, with little or no support from authorities. Meanwhile, the Commonwealth Military authorities confirmed their approval of recruitment marches on 26 November 1915, provided certain conditions were adhered to by each of the Australian military districts. These included directives for the volunteers’ pay conditions, the supply of clothing, the provision of military instructional staff, and of food supplies [see Fig. 8 for more details]. Manera, Brad. New South Wales and the Great War 1914-1918, 2011, Appendix 3, p. 73. Northern Star, 14 October 1915, p. 6. State Archives New South Wales: Premier’s Department; NRS 12060, Letters received [9/4797], A19/122. NRS 12060 [9/4797], A19/122, ‘Gilgandra Route March’, report by E H Palmer, p. 2, 5/10/1915. Scott, Ernest, Official History of Australia in the War of 1914-1918: Volume XI Australia During the War, 1936, pp. 294-295. NRS 12060 [9/4797], A19/122, Minute re: Proposed march of Recruits from Gilgandra to Sydney, 5/10/1915. NRS 12060 [9/4797], A19/122, Letter from the Secretary, The Farmers and Settlers’ Newspaper Limited, 2/10/1915. NRS 12060 [9/4797], A19/122; 15/8235, Memo re: Recruits’ March from Gilgandra,13/10/1915. SANSW: NRS 12061, Premier’s Department Special Bundles, 1895-1976, [4/6261.2], 15/22568. SANSW: NRS 905, Chief Secretary’s Department, Main series of letters received, 1826-1982, [5/7365, 15/47244]. The Farmer and Settler, 16/11/1915, p. 3, ‘The Route March’. NRS 12060 [9/4797], A19/122, letter from J H Catts, 31/12/1915. NRS 12060 [9/4797], A19/122, Commonwealth Department of Defence circular 594, 26/11/1915.